Thank you so much, Kim for inviting me here today! I truly feel so unworthy to be a part of this series. It's actually kind of funny which room I chose to share as my favorite. For the longest time, this room has been the thorn in my side. It's taken me several years to finally like what's going on. 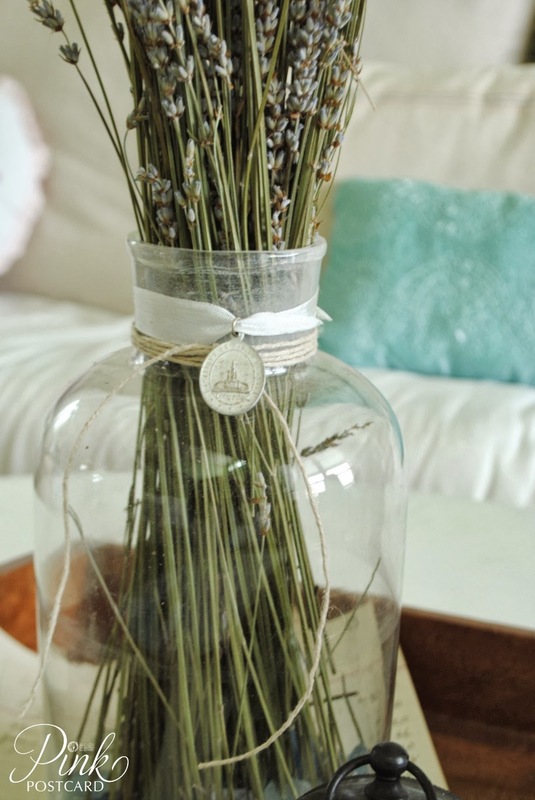 Through lots of editing, trial and error, and constant referrals to Pinterest, I finally began to like our living room- cultivating it into a romantic, calm, rustic place. It's still evolving, but I finally feel like it's what I was wanting- even though I wasn't always sure what that was, or how to make it feel the way I wanted it to. One of the great features of this room is also what's been the most challenging. It has two story ceiling height and a large sloped wall. Finding art or something to fill such a big space was a huge challenge. 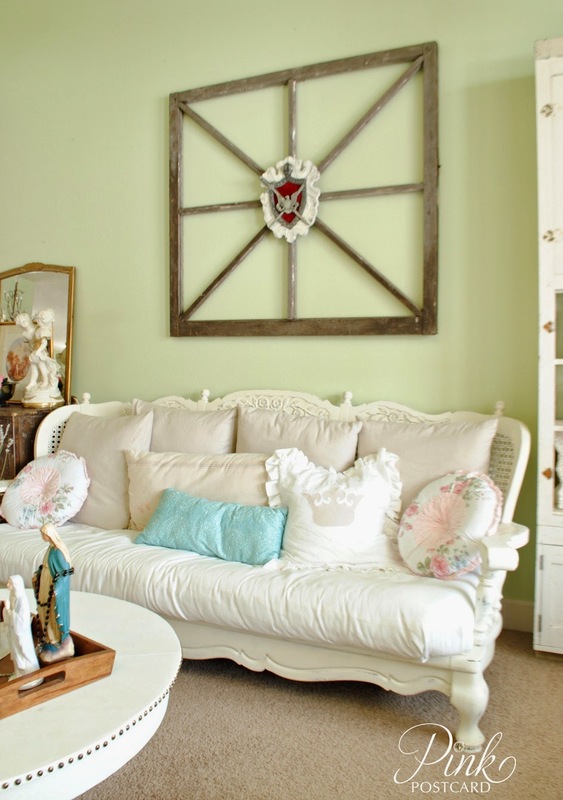 I found this salvage window frame from a vendor I work with, and loved it because it evoked a Union Jack. 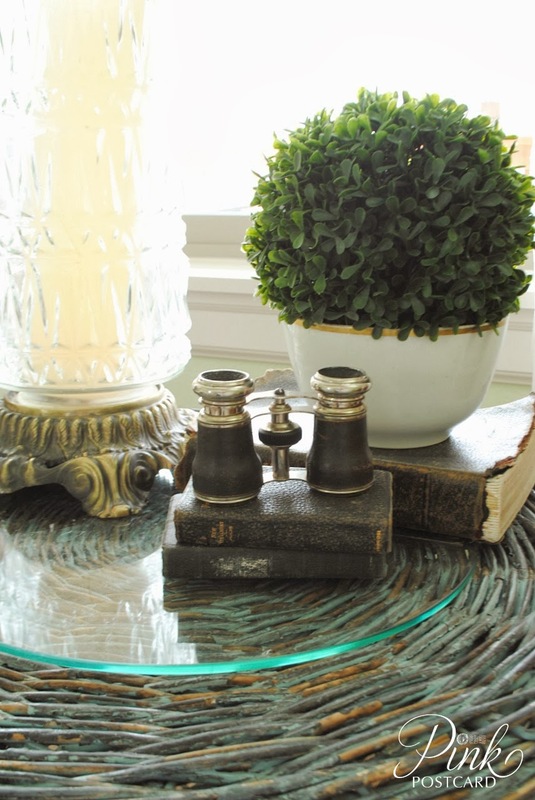 I am an Anglophile, and love adding English elements to our decor. 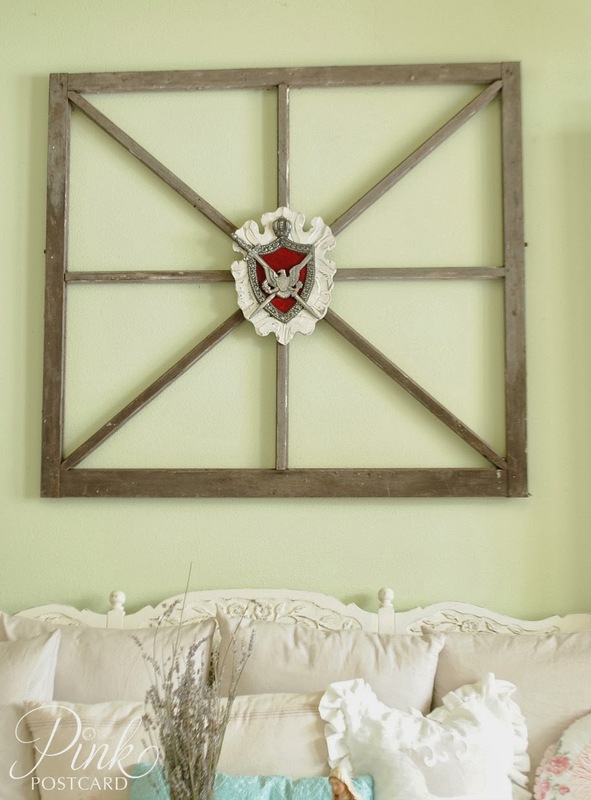 The crest was inspired by something designer Sarah Richardson had in one of her homes. Other than the Ikea couch, all the other furniture in this room has been thrifted. Spruced up, reupholstered, and painted. The large cane couch is what I affectionately call The Beast. It's really deep, and I found it at Goodwill without a cushion. I quickly realized that it was really expensive and really difficult to make one to fit it. My solution was to purchase two crib mattresses, cut them to size, and wrap them in batting and fabric. A coat of white paint, and it is super comfy- nice to take a nap on too! My latest acquisition is the steel Simmons dresser I found on Craigslist. The industrial finish lends a great element to the room. I also love the bit of Oregon history behind it. Kinda unusual and cool- it's from the mental institution here in town. (Oregon State Hospital was the film site of "One Flew Over the Cuckoo's Nest" starring Jack Nicholson). Now it adds a great chippy, industrial look to the room. A mix of sparkle, warm woods, white, and soft fabrics gives this the mix of masculine and feminine that I wanted. 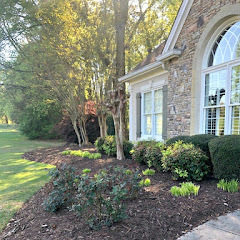 Our living room has views of the surrounding hillside and our front porch. It has beautiful views year round. Gorgeous fall colors from the hillside, Christmas lights twinkling from the neighbors near and far, and stunning sunsets. It's also our spill over room for guests, since the dining room is next to it. 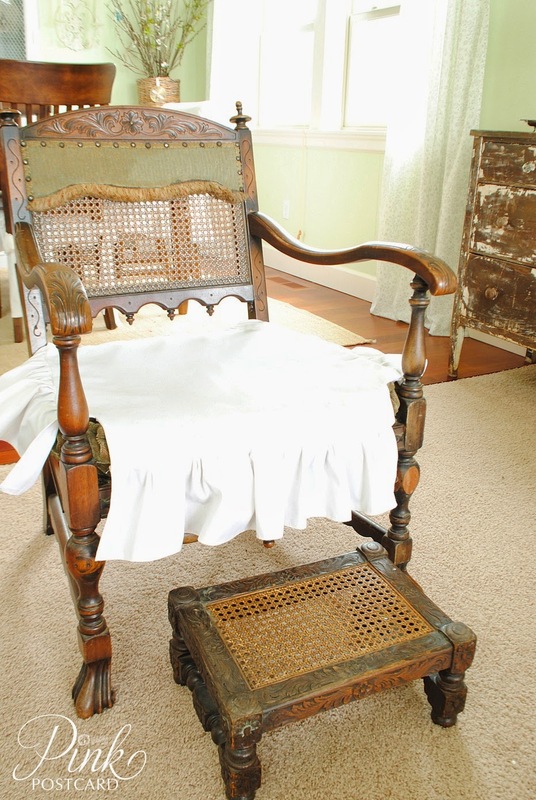 I've been switching some of our seating out for antiques that have simple slipcovers. I love the details and richness it brings to the pale colors. Thank you so much for inviting me here to share our space, Kim! Thanks, Denise for sharing your favorite room with us. I love that mental institution chest. Such great patina. 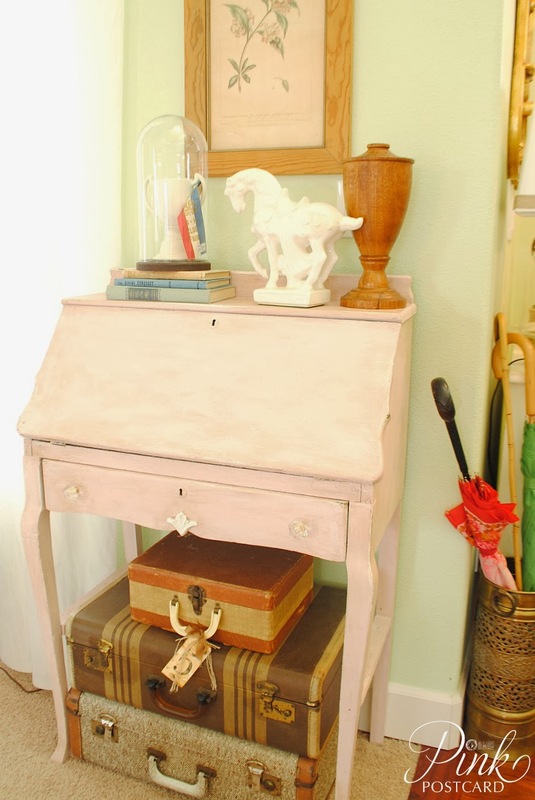 I hope y'all will go over and say hi to Denise at Pink Postcard and tour more of her pretty home. She has a house tour tab at the top of her page. Happy Valentine's Day and have a fabulous weekend! Beautiful room Denise!...Love all the wonderful details from the "Union Jack" window frame with that great crest to the great "mental institution chest"..what a conversation piece!..and your "beast" is beautiful!...You certainly found "beauty in that beast"...:) Thanks again Kim for another great Favorite Room and Happy Valentine's Day to everyone!!! Thanks for sharing Denise. 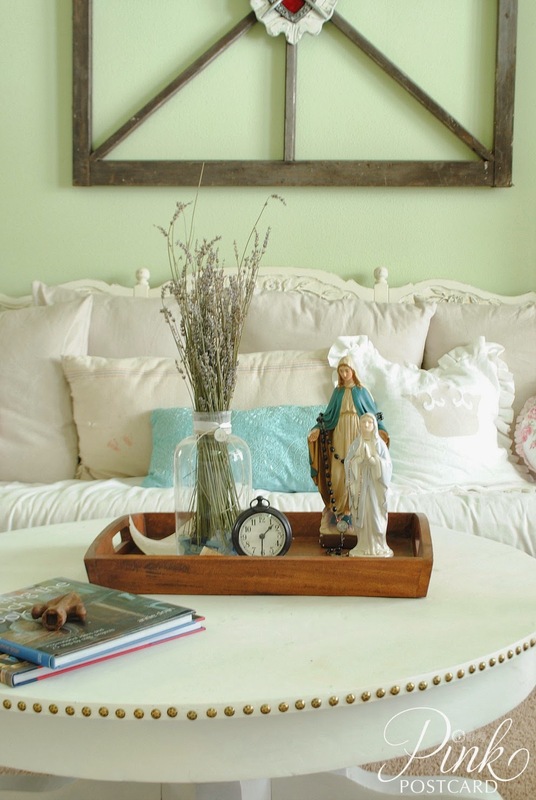 lots of prettiest... luv the antique settee and the story behind the chest. Thanks for showcasing her beautiful room Kim. Everything in Denise's room is so pretty and I love the fact that there is a story behind each piece. 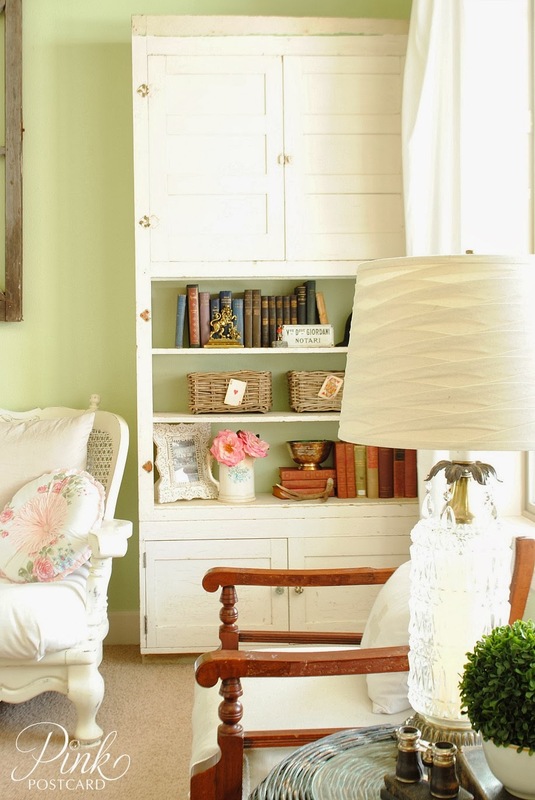 I love the shade of green paint on the walls, too! Thank you Christina! I found out after I bought the window frame that she had 3 more!. I think they all sold though. I hope you find a wonderful piece of your own that fits what you're looking for! How sweet! How different! Thanks, Kim, for sharing. Happy Valentine's Day! 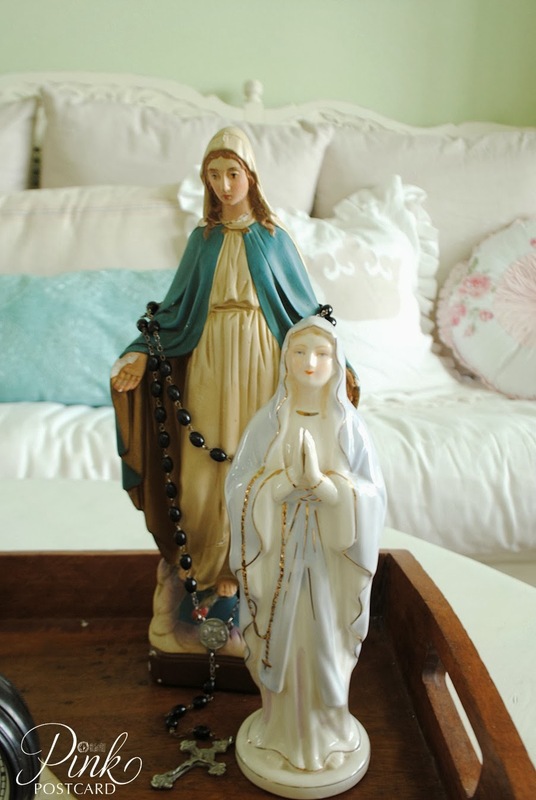 Love your charming room, Denise! From the steel chest to the cane sofa, it's all so interesting. Brilliant to make the seating out of crib mattresses! Kim, thanks for sharing this room. Such a pretty room! I don't think I've seen her blog before. I'll have to go check it out. 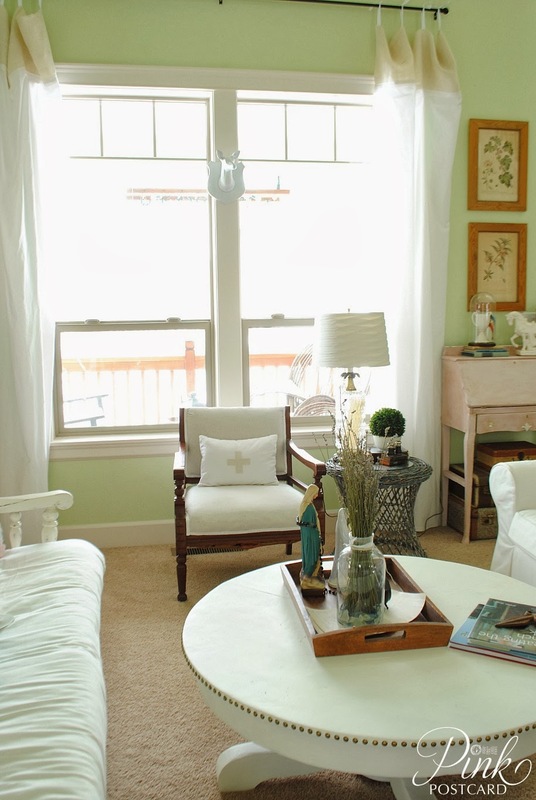 What a lovely, comfortable, and inviting room Denise has created! 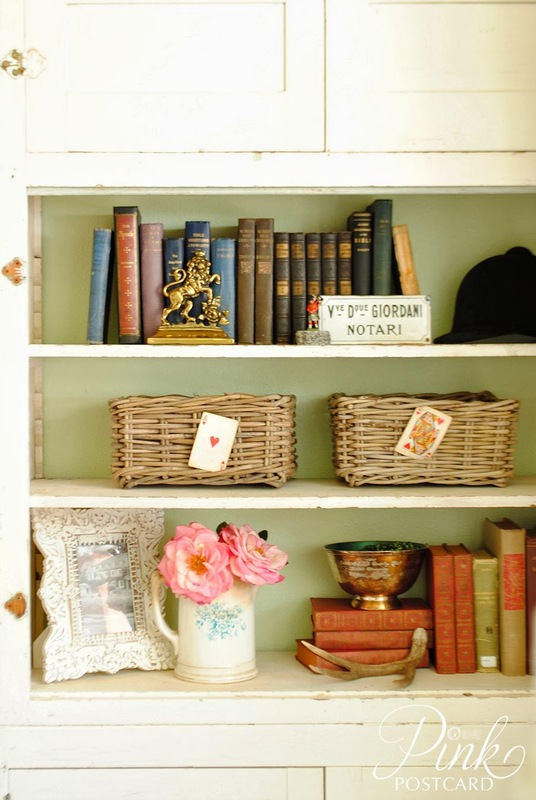 I love all the interesting pieces and vintage items she's incorporated to add personality and charm. 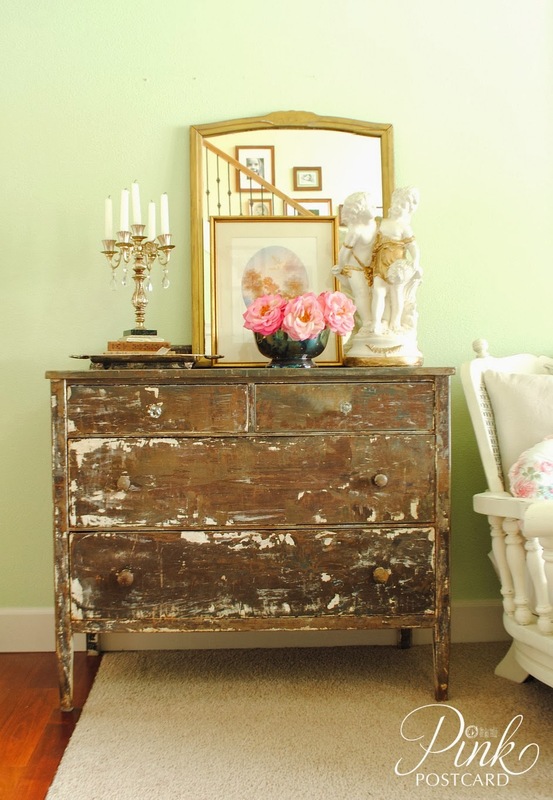 Of course, that chest with the fabulous patina stole my heart. Denise's home is so bright and pretty...she has it filled with so many pretty pieces...that chippy chest is my favorite!! Really refreshing! 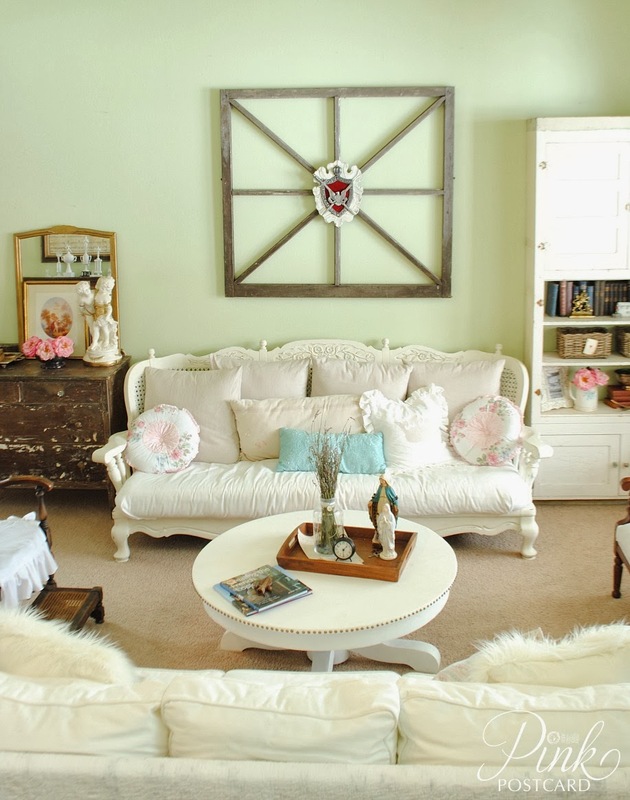 I love all the light colors and oh how splendid are some of her antiques!! 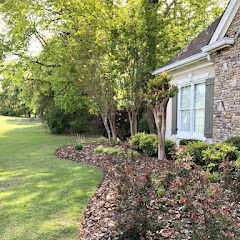 Thanks for sharing your home Denise and thank you for the post Kim. Happy Valentine's day to you all! There is no better feeling than when you find your groove! 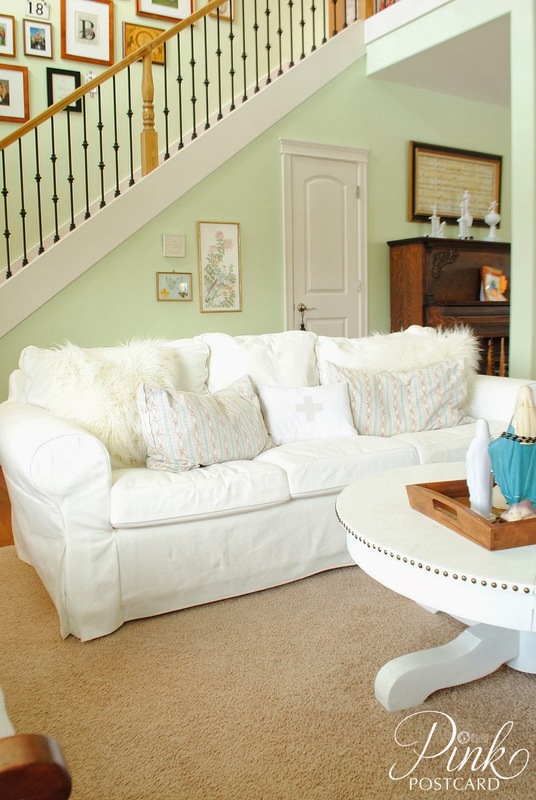 This room is so bright and cheerful! Hello: You have some very beautiful pieces and obviously a good eye. I was wondering if you ever thought of putting some thing on that wall at an angle? It seems the items all are all lined up against the wall with no room in between the items. Thought maybe a angle on the bookcase might help. But what do I know. I want almost everything in your house!!!!! I can empathise: we just built this new home last year and I am STILL trying to get the right "fit"here. This week I ahve been "tweaking" all over! Your living room is lovely, you have done a beautiful job! Love that chest! Have a great weekend. Another great feature, Kim! 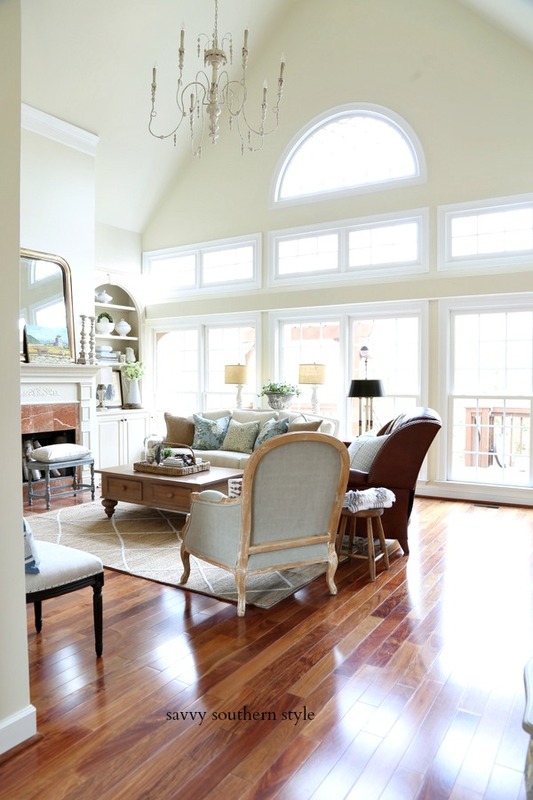 What a great and beautiful room this is and o inviting. I love that chair and footstool so much character. I love the room! I get Denise's blog in my email. 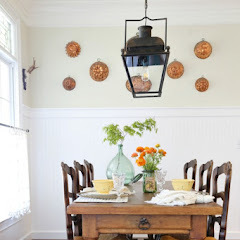 I've followed for awhile and love all her makeovers of furniture too. I really like the chippy dresser! 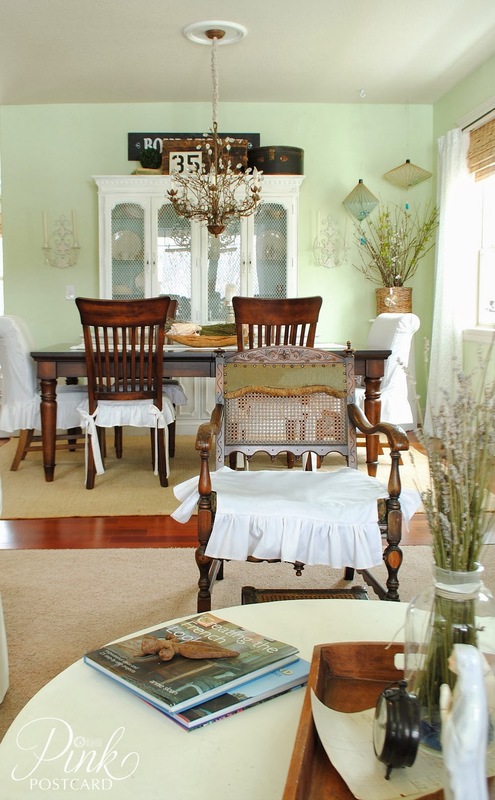 Wow, Denise has so many gorgeous details and vintage pieces in her beautifully decorated living room. I love this room--everything looks perfect! I love "the beast" what a great idea to use the crib mattresses--very inspiring! When I first started following Pink Postcards I noticed the Cane Couch because it has the look of what a home should have...Comfy Love. The couch is absolutely beautiful and I love the way you used two baby mattresses as the cushions...Brilliant!!!! 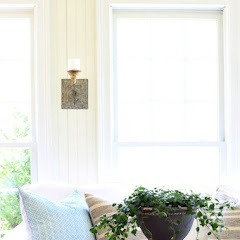 The room itself is light and bright and I love the window!!! Great choice of a room to share!!! 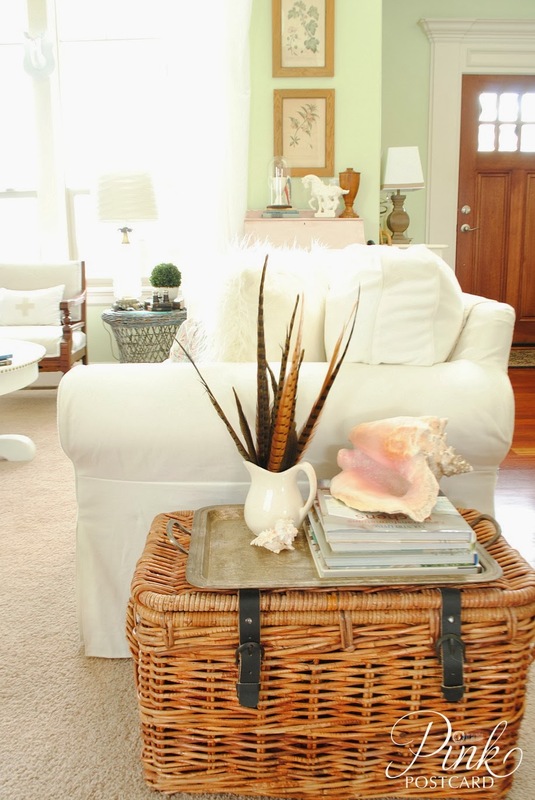 Wow Denise has amazing style,love this room! 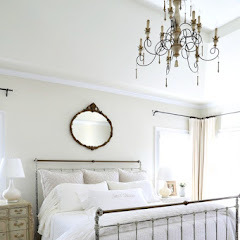 Denise's room has a very cozy and crisp style. A collected over time look. Very pretty.